Why Buy Rainforest Climbing Plants? Rainforest Climbing Plants (the green book) is an essential companion to “Rainforest Trees and Shrubs” (the red book” by same authors) for amateur and professional biologists as well as field naturalists. This book extends the coverage and information that was included in the earlier ‘Green Book’ so that it now includes rainforest climbers from Rockhampton to Victoria. Rainforest Climbing Plants will be widely used by professional and amateur botanists and ecologists, entomologists, environmental consultants and planners, architects, horticulturalists and landscape designers, students, school teachers and university lecturers as well as rainforest enthusiasts and gardeners. 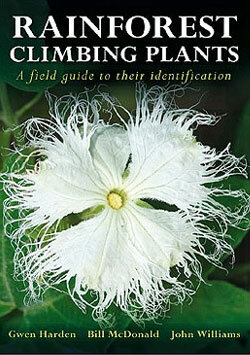 It will enable many to identify and recognize climbing plants that grow in their local rainforests. The introduction outlines the basic leaf characters that are used in the identification of the species and diagrammatically illustrates and compares the various rainforest types that occur in the area. “Many thanks for the new “Green Book” – in no time, I am sure that the pages will be dog-eared, as was the case with the original climbers book.